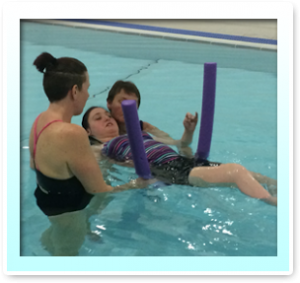 Positive Positioning is proud to be delivering Hydrotherapy training to Leeds Adult Care staff to enable them to support people into the hydrotherapy pool at Holt Park Active. For more information please contact us. Hydrotherapy, sometimes called Aquatic Physiotherapy, is physiotherapy practised in warm water. The properties (buoyancy) of water mean that you can be de-weighted in the water providing an opportunity to move in ways not always possible on land. The water is 32 – 35oC, allowing muscles to relax so that spasms or spasticity are reduced. It can also be helpful in easing pain. Although it may seem relaxing you can do a really good work out in the water and help mobilise stiff joints and strengthen weak muscles. Hydrotherapy / Aquatic Physiotherapy can accelerate healing in neurological conditions and can provide a general sense of well-being. A Chartered Physiotherapist or experienced therapy assistant will be with you in the water at all times. Water-based exercise is not right for everyone therefore before entering the pool everyone must undergo a dry-land assessment to assess suitability and identify the goals of the treatment. Positive Positioning has access to a number of pools across the region, however, the time and day of the week may be limited. Please contact the office to see what is available in your area. Some medical conditions are contra-indicated. All pool users are subject to a health check.